In this day and age, businesses look for just about anything they can grab hold of that will set them apart from their competition in the eyes of consumers. Everyone is striving to be better than the “guy next door,” in the hopes of attracting eager customers and ushering them through the front gates, checkbook in hand. That’s the world we live in. And the recreational marine industry is no exception. Dealers want to find ways of distinguishing themselves from their counterparts and secure a bigger piece of the boat-buying pie. But how can they accomplish this? What can a dealership do to help itself shine brighter than those surrounding it? Become Marine Industry Certified, of course! The Certification logo posted inside a dealership acts like a neon sign, alerting consumers that your establishment is one that truly cares about its patrons. That’s something buyers definitely notice. They want to receive the “red carpet” treatment. They want to be loved and pampered. They—especially buyers new to boating—want someone to hold their hand through the purchase experience and tell them everything’s going to be OK. New boaters want to feel confident you’ll work with them to ensure they walk out of your dealership with a boat that’s just right for their family. This is how you retain customers long-term; how you get them back inside your dealership when the kids get older and it’s finally time to upgrade to that bigger boat. Becoming Marine Industry Certified is a clear win-win. But don’t take my word for it. Just ask the more than 300 dealerships that have already gotten involved and earned official Marine Industry Certified status; or the additional 275 that (at the time of this writing) are currently enrolled in the program and actively working toward Certification. All of these dealerships are seeking means to improve their business practices and get noticed by potential boat buyers. Becoming Certified is the ideal way to accomplish both goals at once. And when you weigh the small cost of Dealership Certification against its mound of potential benefits, the decision is really a no-brainer. Think about it: Certified Dealerships receive listings on DiscoverBoating.com, the number-one online resource for unbiased boating information. This listing provides consumers with direct access to the Certified Dealerships web page. In 2007, more than 3.2 million people visited the website—looking for everything from boating safety tips to where they can locate a dealership near them. If your dealership was Marine Industry Certified, you’d be one of those listed. Who wouldn’t see a clear benefit in that? A consumer brand awareness campaign is already underway (as of this summer) in the online boating media regarding Dealership Certification. Marine Industry Certified Dealerships that advertise on boats.com, BoatTrader.com and BoatTest.com are recognized with the Certification logo next to their listings. Banner ads run throughout these sites and link directly back to the Dealership Certification pages on DiscoverBoating.com. In 2008, efforts are being stepped up yet another notch, as Dealership Certification representatives will actively work with consumer boating media to write articles in their magazines and for their websites about the program and why boat buyers should want to buy from “Certified” dealers. Consumers will also be able to easily locate Certified Dealerships at the 23 consumer boat shows owned and produced by the National Marine Manufacturers Association (NMMA)—through special boat show signage, designation on each boat show website, and recognition inside the respective boat show directories. My point is this: Dealership Certification is good business for more than one reason. Not only will completing the program help a good dealership become a better dealership, but it will also serve as a superb marketing tool to attract consumer attention in an otherwise cluttered and confusing retail landscape. Certification is one way to set yourself apart from your competitors; a designation that may result in increased foot traffic—and ultimately increased profits—for your business. At the end of the day, I don’t know any dealership that would say “No” to more customers and more money. As always, I encourage every dealership that hasn’t yet taken steps to become Certified to visit DealerCertification.org and sign up to attend an upcoming Launch Workshop—the very first step in the Certification process. 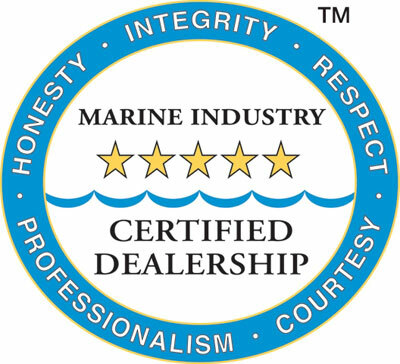 For additional information about the Marine Industry Dealership Certification program or how to get enrolled, contact Dealer Certification program manager Elizabeth McAllister at (312) 946-6500; emcallister@DealerCertification.org.